Being both Republican and African American requires going the extra mile which includes developing skills for dealing with the “tolerant” Left. The South Carolina senator’s one-word response to the now-deleted tweet – “Senate”. Scott was informing the hater that both he and Smith, who is a former aide to Sen. Sessions, worked in the Senate. “It’s crazy how many times I’ve been called either the n-word, or an Uncle Tom … simply because they do not agree with me,” Scott said in a statement to Aol News. 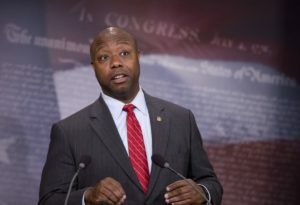 Scott was sworn into office in 2013, making him the first black senator to represent South Carolina since Reconstruction. “I remember back in my House office we had to shut the phones down during one of the debt ceiling votes because I had staffers crying after so many racially charged phone calls,” he said.